Search Results: 18 results in 0.0046 seconds. C5rider started a topic Convertible Mustang makes 2,000 horsepower! Convertible Mustang makes 2,000 horsepower! "Who in their right mind would make a convertible into a race car!?? " C5rider started a topic And one for the Mavericks! And one for the Mavericks! This street-fighter knows how to rumble! Josh Dillon has been customizing his 1973 Ford Maverick for speed and has also been able to do it on a budget. C5rider started a topic 5 things you should never do with a turbo-charged engine! 5 things you should never do with a turbo-charged engine! Pretty good video and explanation of why doing this is bad for your engine. This twin-turbo'd 5th Gen Camaro took home the win in the True Street class of this year's Drag Week. Could a rear-mounted turbo setup be a viable option for your next mod, or is this unusual layout not worth the hassle? 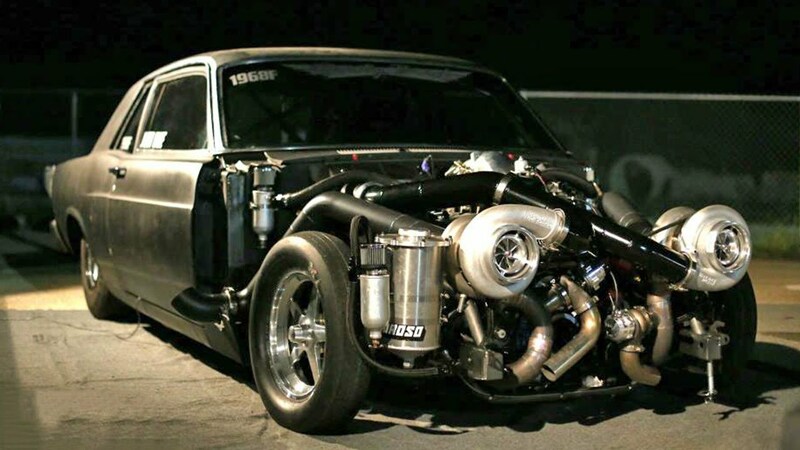 Turbos on a small block Ford. Bigger IS better! A simple, carbureted 347ci small-block streetable turbo engine that makes 1,000 horsepower. Take a video tour and hear as this all-billet motor cranks the dyno at Steve Morris Engines. C5rider started a topic How bout a little twin turbo Falcon? How bout a little twin turbo Falcon?